The Poppy Patrol was up before dawn on March 12, 2012. 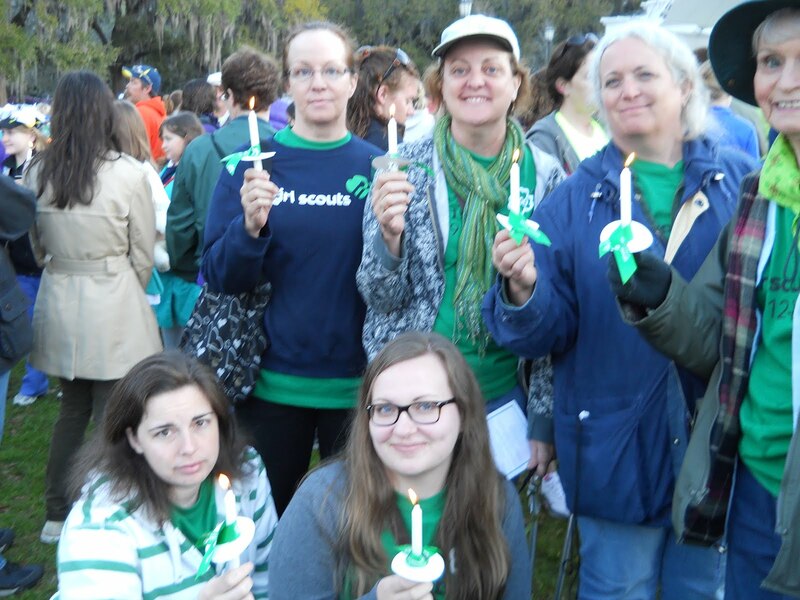 While most of Savannah slept, Girl Scouts were setting out in the cool, quiet darkness. At Forsyth Park, the sunrise birthday celebration was about to begin. We signed in and got our programs and candles, and joined the gathering throng in the field in front of the bandstand. It was a thrill to be surrounded by joyous sister Girl Scouts in the city where it all began 100 years ago. The ceremony featured a procession of Girl Scouts in historic uniforms, the presentation of the “Juliette Candle,” and the color guard. There was a flag ceremony, songs and an enthusiastic greeting by Anna Maria Chavez, Girl Scouts of the USA’s CEO. Anna Maria started the passing of the candle light from the Juliette Candle. After the candles were flickering everywhere, we sang “Happy Birthday,” savored a reverent moment, then made our wishes and blew out the candles, which we then kept as keepsakes to take on our way. The Poppy Patrol and many other groups spread out into the city to celebrate over breakfast in cafes. There was a festive mood all through the city as happy Girl Scouts populated the restaurants. After a good meal, the Poppy Patrol then made its way to the Juliette Gordon Low Birthplace and joined a line of eager Girl Scouts for the first tours of the day. It was so special to be in that house and garden with other Girl Scouts who had traveled from many places to be part of this historic day. It has been fun to see Girl Scouts all over Savannah all weekend. We are quite recognizable everywhere, not just because of our color-coordinated T-shirts and distinctive gear, but by our enormous smiles! We can be seen in the city squares, shops and cafes where we are making new friends, taking pictures for each other and exchanging SWAPS! Poppy Patrol Pop Trivia Question #3: What percentage of female U.S. senators were Girl Scouts? What about female members of the House of Representatives? So many Girl Scouts were up early for the 100th birthday sunrise ceremony! Color guard in vintage uniforms. Check out this amazing tote bag made out of an old Girl Scout sash! This video was taken during Saturday’s festivities — just a clip demonstrating the fun, Girl Scout-y scene.